you aren't taking enough risks." 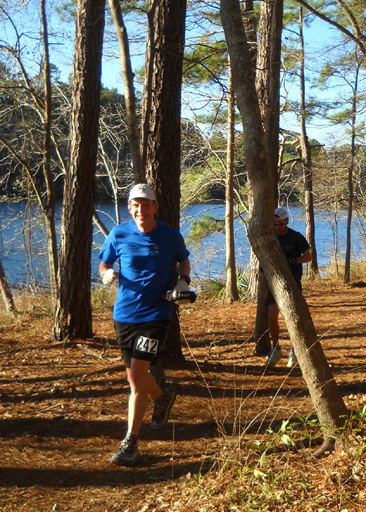 Our main reason for hanging out at Huntsville State Park the last two weeks was so Jim could train for the 50-mile Rocky Raccoon race in which he was entered. Unfortunately, his right knee hasn't adequately healed from the meniscus surgery he had in early December. Running too soon afterwards at ATY in the Phoenix area on December 29 apparently wasn't the best idea. A few days ago, after consulting with his orthopedist in Roanoke by phone, he decided to give his knee a total rest from running for at least a month. That meant withdrawing from Rocky Raccoon, not an easy decision for him to make. Oddly, his knee feels just fine when he's walking or running or riding the bike. It only hurts when he's sedentary, especially when he's trying to sleep. It often keeps him awake at night. Last year when plantar faciitis disrupted Jim's training and prevented him from running this race, we volunteered at the start/finish in the drop bag area and did some other jobs before and after the event. Neither of us was up to that much physical work this year so we were just spectators on race day. Jim picked up his packet but we didn't watch the race starts/finishes or go to the awards ceremony. It's becoming more difficult for either one of us to maintain a high level of interest in ultras when we can't run. We did have some friends running in the race, however. We talked with several of them at packet pick-up and cheered them on during the race. Later in this entry I'll show photos of some of the runners at the two places where we observed the race. I mentioned in the last entry about the massive winter storm that blanketed much of the eastern two-thirds (maybe more) of the country in ice and snow this past week. That caused some major problems for both race management and many of the 700 runners entered in this race. Yes, Rocky has grown that large! That one is almost three feet in diameter. 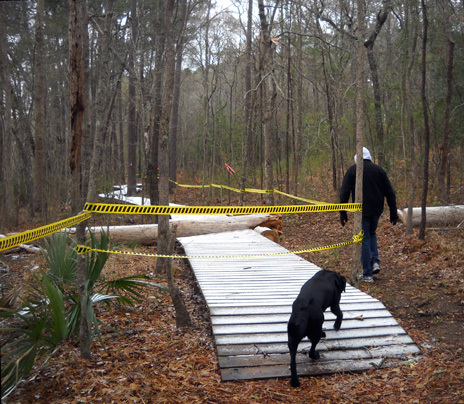 Prairie Branch Trail next to the east side of the lake was a real mess after the storm hit last Tuesday morning. 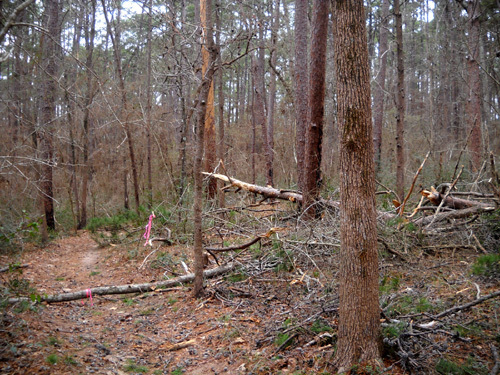 I spent several hours on Tuesday and Wednesday removing limbs and branches from that 1�-mile loop, most of which is on the race course. My motive wasn't totally altruistic; I've been going out on that trail daily for walks because it is the most scenic one in the park and the closest to our campsite. 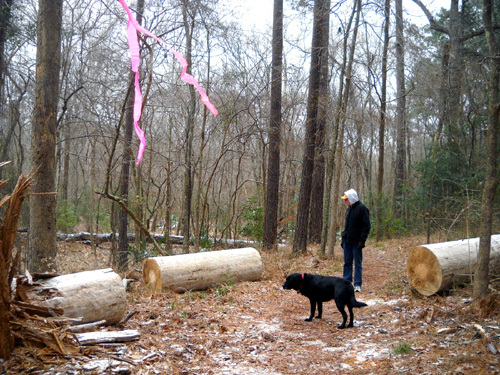 I joked with Jim that we should get a free night of camping for all the work I did removing debris from that trail! 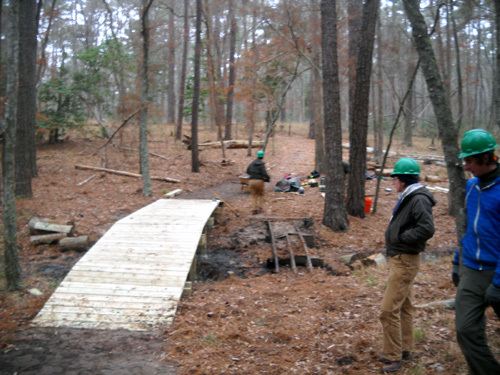 Picking up limbs and branches on trails was part of our camp hosting job at Brazos Bend SP last year. 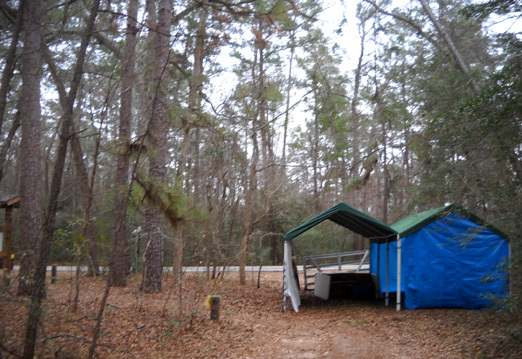 Free camping was our reward. Wednesday afternoon I saw that someone had marked the race course with ribbons. I was familiar with the courses and realized that some of the markers were placed incorrectly on the inner Prairie Branch Loop. I didn't move them, but told Jim so he could let RD Joe Prusaitis or Henry Hobbs (the guy in charge of course marking) know. The ribbons were placed correctly by race day. 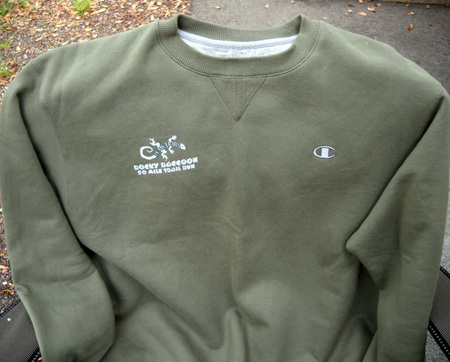 I was on my bike that day when I "ran into" three very fast runners, one of them Karl Meltzer, on the Chinquapin Trail. Cool! I didn't recognize the other two guys. This race attracted some well-known elite runners. I'll talk more about them in a bit. The Rocky loops have many turns but, as usual, they were marked so well that even incoherent 100-mile runners should not have gotten lost during the race. 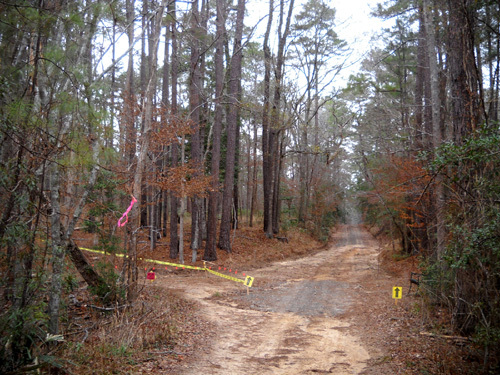 Yellow tape and red signs indicate "don't go there." They were just cleaning up and I got to "initiate" the bridge. Runners got to use it during the race. We woke Friday morning to find about half an inch of sleet and snow on the ground. That was much better than the predicted 3-4" of white stuff. The temperature hovered around 20�F. We were happy to stay inside our cozy camper all morning. Oh, my. We wondered how the runners could possibly run across them in the morning . . . Jim and Cody even walked around that one. Good thing. If anyone had hurdled that tree in the morning they'd slide a good ways on the other side. Jim and Cody give perspective to how large that sucker was. 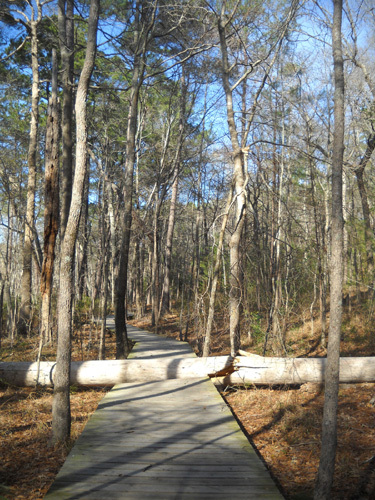 Sure glad I wasn't out on the trail when that thing came down. 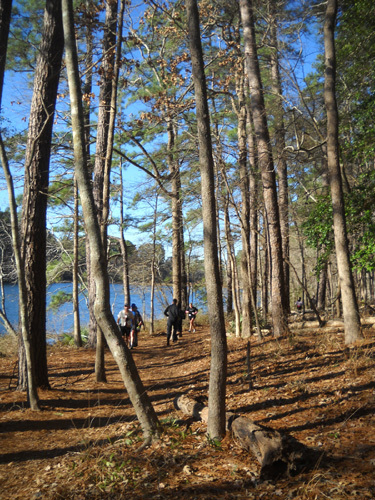 I usually avoid trails in pine forests on really windy days. 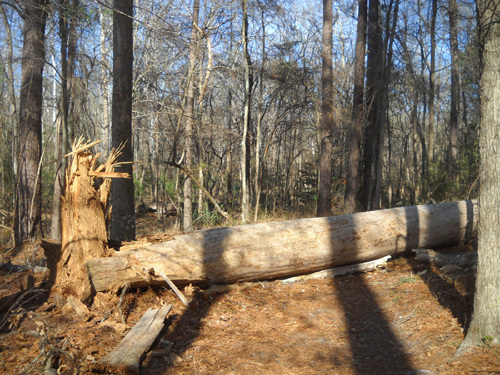 Even a falling limb can kill you. 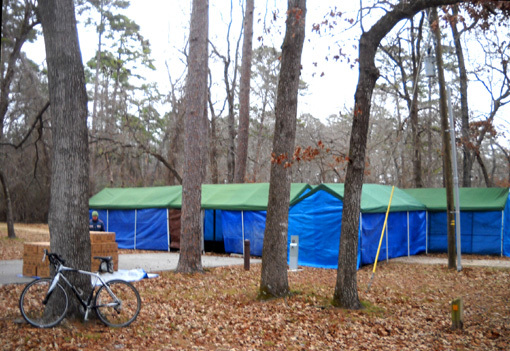 Temperatures at Huntsville State Park ranged from the teens at night to the upper 20s F. during the day from Wednesday to Friday. That's about 25�F. below normal, not what most runners expected when they signed up for this race. Fortunately, we dodged the predicted 3-4" of sleet and/or snow overnight Thursday/Friday at the park and got just a light dusting. Even though the sun came out on Friday afternoon it was still below freezing when runners showed up in town to pick up their race packets and attend the pre-race dinner. It got even colder that night, down to 19�F. 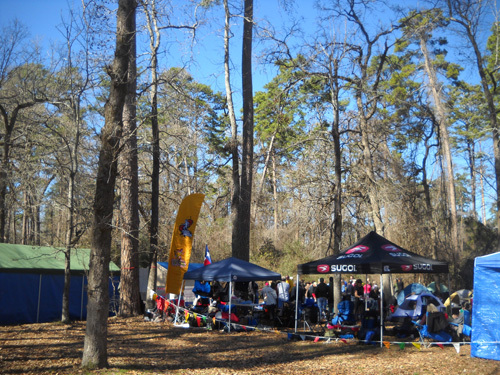 In addition to the challenges race management faced with the frigid weather at Huntsville as they marked the course and set up headquarters and the aid stations, runners from around the world found themselves with challenges just getting here. Airports all around the country and even in Houston were affected by the massive storm system that lasted several days before the race. Some people couldn't fly in or out. What was so ironic to Jim and me was that we were in the park . . . but unable to run. And there were quite a few runners willing and able to run . . . but unable to get here for the race! Not only were airports snarled across the country, even the roads in much of Texas were icy and nearly impassable on Thursday and Friday. We read tweets and ultra list posts by runners who had difficulty driving I-45 between Dallas and Huntsville -- and other roads leading to the race. According to RD Joe Prusaitis' post-race report, only 512 of the 700 race registrants made it to the starting line. It's common for ultras to have up to a 10% DNS (did not start) rate, but not this high. Fortunately, some of the runners were able to keep or change their flights and get here on time. Tammy Massey comes to mind. She initially posted to the ultra list that she wouldn't be able to get out of Baltimore but she did. Other friends like Julie and Val Aistars from Chicago, Paul Grimm from Colorado, and Kathy Lang/Jim Ballard from Oregon had to miss the race because of the weather. For the hundreds of runners who did make it to the race start . . . I'll describe later in this entry the challenging course conditions they faced early yesterday morning. WHY IS ROCKY SO POPULAR? 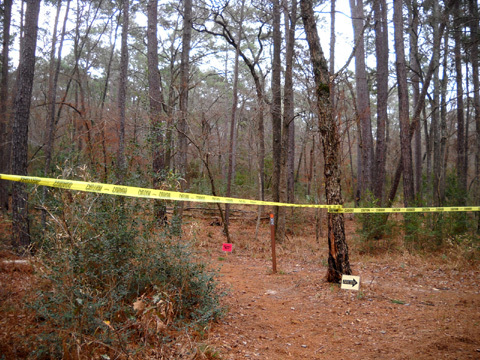 This is the 19th year for the Rocky Raccoon 100-miler. The 50-miler was added more recently. Both races have become very popular for a number of reasons:. The event is well-organized and has a good reputation. Joe & Co. know how to put on a good race. 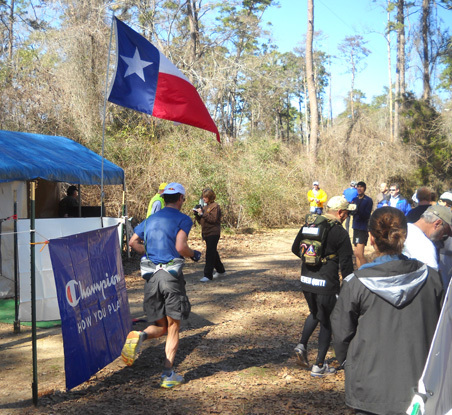 Tejas Trails has an entire series of trail races from 5K to 100 miles in length. It's in an appealing location in the dead of winter, usually warmer than most other places in the U.S. There are no qualifying standards to get in. The entry fee is moderate. Up to 700 runners can enter (i.e., no lottery or quick close-out). The scenic, multi-loop course is not too hilly and not too flat. The footing is mostly good, making it a relatively "fast" course. There is historically a pretty high finish rate. 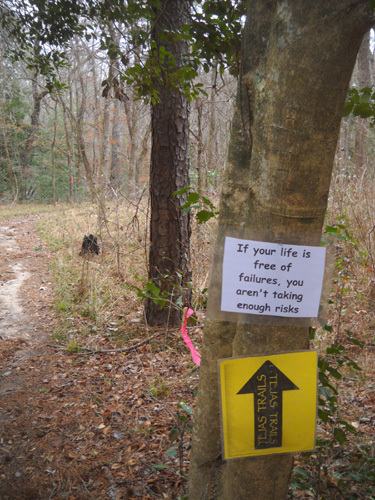 It is so well marked that runners don't tend to get lost. 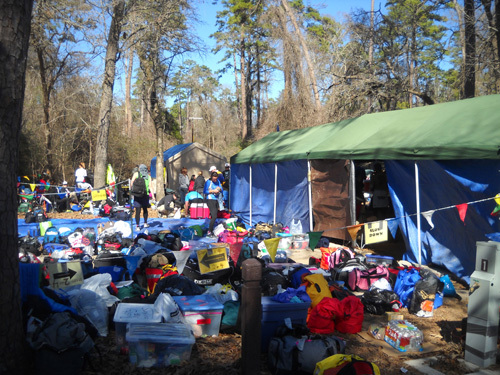 The aid stations are well-spaced, well-stocked, and manned by competent volunteers, many of whom are either ultra runners themselves and/or have worked this race many times. It's an excellent race for first-timers at either distance. The 100-mile race has a 30-hour limit and allows slower runners to start an hour early so they don't miss the awards breakfast (they still must finish within 30 hours to buckle, however). Fifty-milers have a generous 29 hours to finish, allowing walkers and slow runners to participate. 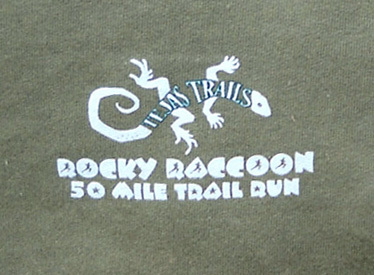 In this day and age with some of the popular 100-mile races closing out in a matter of minutes or having lotteries with tough odds for entry, Rocky is a great opportunity for runners of every caliber to experience a well-run (pun intended) race. One of the problems with the growth spurt in ultrarunning the last few years -- primarily due to publicity by/about Dean Karnazes and from Christopher McDougal's book Born to Run -- is the difficulty for a bunch of elite runners to enter some of the most popular races where they can compete against each other. Some would say they deliberately avoid competing against each other so they can win more races, but recent blog entries by some of the sport's top runners indicate they want to compete against each other. They know that competition makes them run harder and smarter. Approach to the Dogwood AS during the race; this was the turnaround point after each loop. So it was exciting to read on the internet ultra list that Rocky Raccoon might be the first time some of these guys would test themselves against each other this year. It's early in the season, however, and most of them have more prestigious and/or international races later in the year in which they hope to peak, but Rocky allowed them an opportunity to decide quite close to the race date whether or not to enter. It's not like Western States where they have to get their dibs in many months in advance and hope to make the lottery, or Hardrock where speed isn't as important as having finished at least five times previously and securing a guaranteed entry. Nope, with Rocky they could decide within a few days of the race whether they wanted to compete. It's great that there are opportunities like this -- for slugs as well as gazelles. All any potential participant had to do was watch the entry list and make their decision before the races reached their max. Crews await their runners at Dogwood. As word spread among the fast guys, more signed up. This year anticipation ran high on the internet in the last couple of weeks before the race when folks saw new names appear on the entry list -- Karl Meltzer, Scott Jurek, Anton Krupika, Hal Koerner, Zach Gingerich, Mike Wolfe, and some fast guys Jim and I weren't familiar with like Ian Sharman, Michael Arnstein, and Bill Fanselow. I kept hoping Geoff Roes would enter, too, but never saw his name. 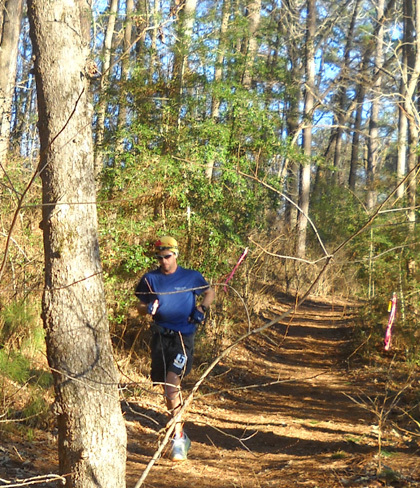 Hal Koerner walks out of the Dogwood aid station at 60 miles to begin his fourth 20-mile loop. Internet chatter revolved around whether one of these guys would be able to break Eric Clifton's course record of 13:16:02 set fifteen years ago. Maybe with good weather, but in the abnormally frigid weather we had leading up to race day?? The cold start on Saturday morning may have actually been A Good Thing for most of these guys who have been training all winter in worse conditions than this! What they were less acclimated to was the sunny 60-degree F. temperature on Saturday afternoon. But that didn't prevent the record from being shattered. Oops. I'm getting ahead of myself . . . 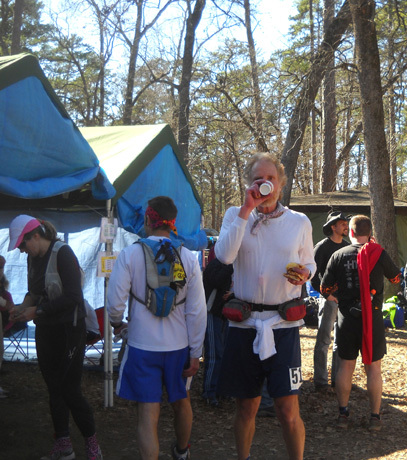 Although Jim did pick up his race packet and timing chip on Friday, he wisely chose to not start the 50-miler on Saturday morning. He needs to let his knee heal. We deliberately slept late, missing both the 100-mile start at 6AM and the 50-mile start at 7AM. It would have been harder for him to see our friends start those races and not be among them. It also removed any temptation to change his mind and run. He turned in his timing chip after lunch. 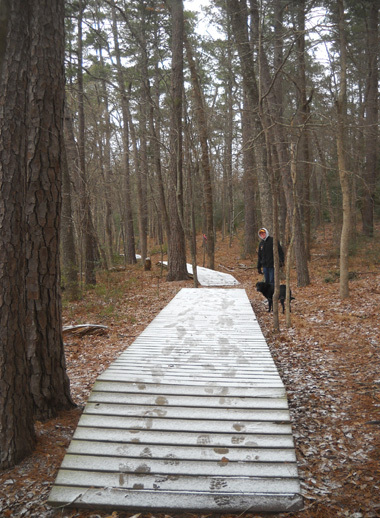 As predicted, temperatures were in the high teens F. That meant the bog boards were still frozen. I'm not sure how many runners were aware of that before they literally hit the first ones. When we got up we checked the race website to see if there were any updates. Those were delayed significantly, but we found lots of tweets from spectators and runners (!) who indicated that the frozen bog boards were indeed causing problems for runners the first few hours until the sun warmed them up enough to melt the ice. Reportedly a couple of runners were injured from falls off the bridges and had to withdraw from the race. 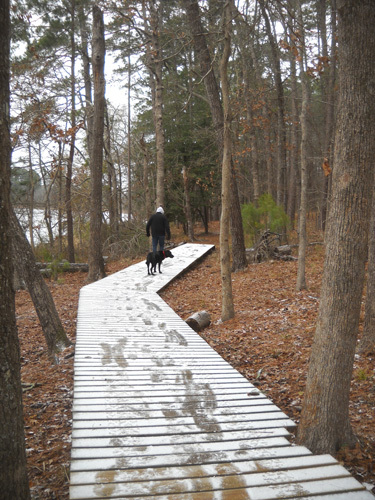 There are bog bridges all around the lake. Along the Prairie Branch Trail it appeared later that runners simply ran off to the side of all the bridges there but they couldn't do that through a couple swampy areas on the Chinquapin Trail. Even that didn't slow the front runners down by much. The afternoon eventually warmed up to about 60�F. It was beautiful with the sun shining, probably too warm for some of the runners from northern states but welcomed by most of the volunteers and spectators. Jim and I watched the delayed splits and read real-time tweets on the computer in the morning. We also went into town to do laundry and run some errands. We didn't go up to the start/finish area until after lunch to see friends come and go from the aid station at the end/beginning of their loops. 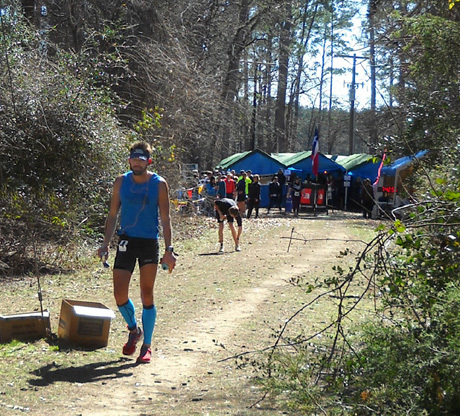 I missed Karl Meltzer when he came in but got him going out of the aid station (blue shirt). Anne looks great after running two of her three 16+ mile loops. So does Matt after 40 miles! 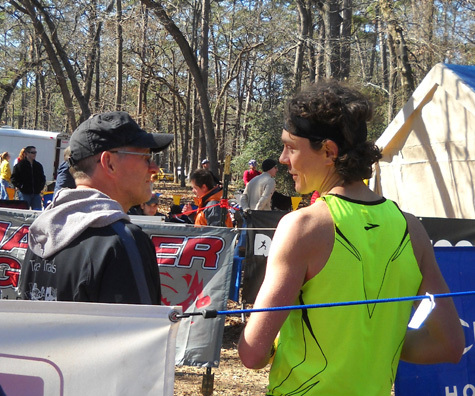 Scott Jurek talks with friends, above, and RD Joe Prusaitis, below. Have you ever looked that good after running fast for 60 miles??? I understood when I heard Scott tell Joe that he intended to run only 60 miles, as it's too early in his training season to do a good 100-mile race. That was some training run! Most of the other fast guys kept on going. Later in the afternoon I walked along the lake on Prairie Branch Trail to watch runners come and go for a couple of hours. Traffic is two-way in this section about two miles from the start/finish area. It's a nice, quiet spot to view the action away from crowded aid stations. By now the fastest 100-milers were 78 to 82 miles into their races, the mid-packers 58 to 62 miles in, and the back-of-the-pack at 38 to 42 miles. Some of the slower runners didn't finish as the temperatures plummeted again during the night. 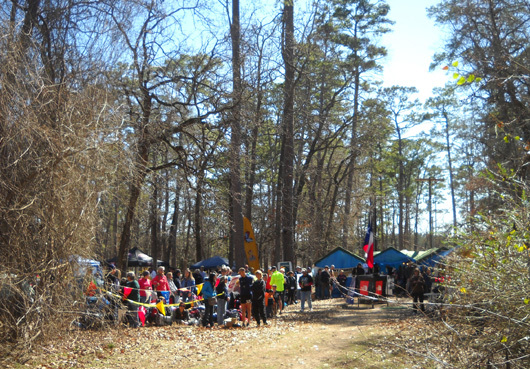 There were also inbound 50-milers who were near the finish of their races and others who had to go out on another 16+-mile loop. The first 50-milers were already done an hour or two earlier. I stayed out on the trail for a couple of hours before the sun set. I sat on a bench overlooking the lake and was able to take photos and offer encouragement to all the passing runners. I tried not to surprise anyone. Unless they were totally focused on their music or inner voices, they could see me from either direction before reaching the bench. I was several feet off the trail but visible. Some of the runners stopped to talk to me, grateful for an excuse to stop for a little while. One woman stayed a couple of minutes in both directions. I had to encourage her to get moving again! A couple runners recognized me from this website, which is one of the reasons I maintain it. It's great to meet people because of these journals. WHERE ARE THOSE FAST DUDES? I was looking not only for friends but also for #6, Ian Sharman. I hadn't heard of him before this race but knew from the tweets and web splits that he was in the lead most of the race. Ian came by so fast at 78 miles that I missed getting his picture. I was determined to "catch" him when he came back four miles later. I saw him coming -- with a female pacer, to my delight -- and got a good picture. I sent it to Ultrarunning magazine and hope it is good enough to be used in their article about the race in the March or April issue. We don't get the magazine any more so if anyone sees a picture of Ian that is credited to me, please let me know. 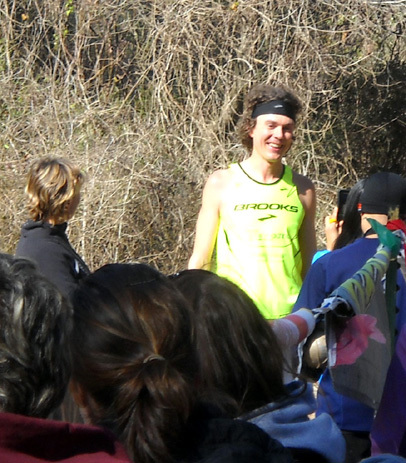 I was very impressed with how seemingly effortlessly he floated by after running for 82 miles. 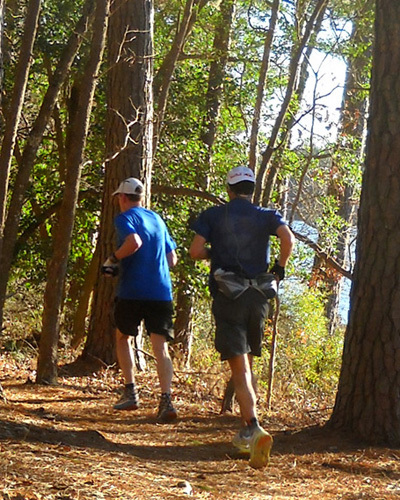 Anton leads Hal (in blue shirt and compression socks) by only a few strides at 82 miles. Both runners were focused and also looked to be in excellent shape despite the miles they'd already covered. Above and below: Davy Crockett "paces" Karl Meltzer for a few miles. I got a better shot of Karl as I was walking back to our camper and he was coming down the Prairie Branch Trail toward the lake. 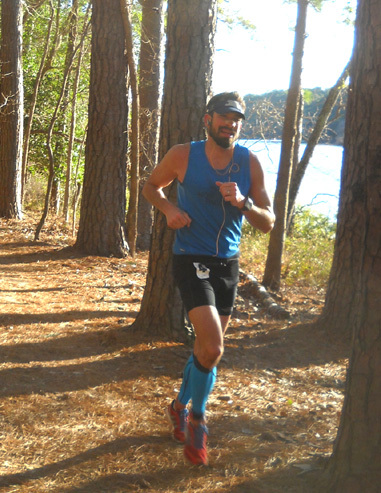 He was outbound on his last loop, about 81� miles into the race. That picture is the next one below. We considered going to the finish area after eating supper but again, we just weren't motivated. It was fun to watch the (delayed) results during the day and wonder if Ian could keep his lead and/or break the old record of 13:16. If he had a good 5th loop, he might break 13 hours! Even that possibility wasn't enough to nudge us out the door, however. By all accounts the finish line was packed after 6PM as 11-hour 50-milers were finishing and anticipation grew about whether Ian Sharman, Anton Krupika, or Hal Koerner would break 13 hours (7PM) in the 100-mile race. Karl Meltzer had slowed down and was running in fourth place, not likely to break 13 but not a shabby pace, either..
To the delight of the crowd, Ian blew away the old course record by over 31 minutes, finishing in an astounding 12:44:33 at 6:44PM. 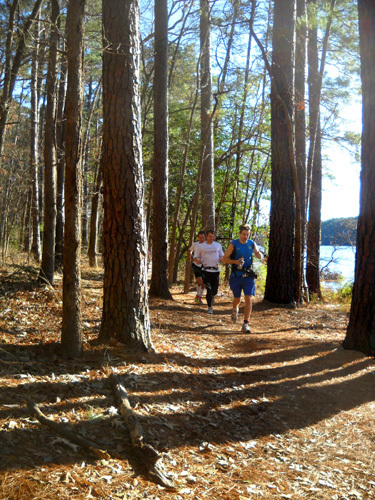 That may be the fastest 100-mile trail time in history. Imagine running a 7:39 pace on dirt trails for 100 miles. That includes time to drink, eat, pee, take clothes on and off as the temperature ranged between 19-60�F., and do whatever else needed doing during the day -- which means he was actually running even faster than that! Anton and Hal battled for second place for most of the race. Afterwards they both said the competition brought out the best they could do that day. Anton finished second in 3:18, faster than when he won the race in 2007 (13:32) but not fast enough to break Eric Clifton's old record. Hal came in third in 13:26. Karl was fourth an hour later in 14:27. The women's race was less exciting only because Liza Howard had no female competition. She finished in fifth place overall in 15:33 to place first female for the second year in a row. It was a course PR for her by about 12 minutes. Early in the race she was up there with the men, then realized she was going too fast. Her blog entry about the race is interesting and amusing. Liza's nearest competition, Brenda Carawan, was seven hours behind her. Click here for 2011 results in both races. 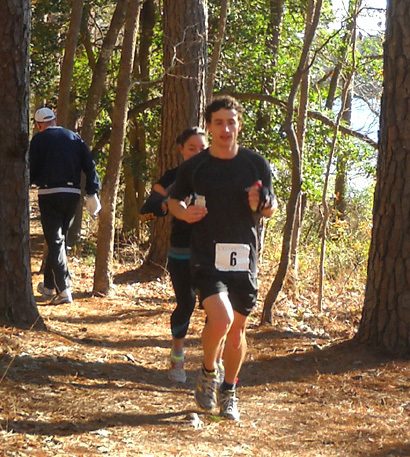 Click here for prior year race results and some good photos of this year's top runners. #1 is Anton Krupika, #4 is Hal Koerner, #5 is Karl Meltzer, and #6 is Ian Sharman. Note the frost on Anton's beard in one of the photos. Liza Howard is probably #8 in the pink shirt. I can't find a list of the runners' numbers now and I don't know what she looks like. I can't find a blog or website for Hal Koerner. 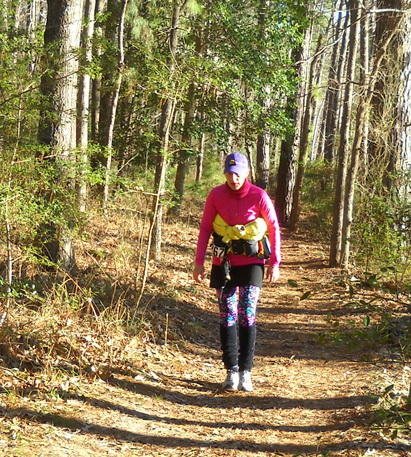 Kim Sergeant is bundled up for her fourth loop in the 100-mile race. It will soon be dark, and the temperature was quite cold again Sat. night. Davy Crockett's race reports are always interesting, too. In his Rocky report he talks about how much fun it was to speed up mid-race to run with Karl for several miles. Davy ran a fine 21:22 to finish in 34th place overall. 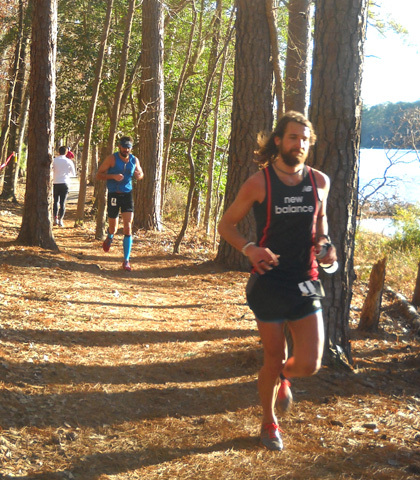 The winner of the 50-mile race also set a new course record. Todd Braje ran a quick 5:43 to beat his nearest competitor by 33+ minutes and smash the previous record of 6:01. Maria Clemente, first female and 11th overall in that race, finished in 7:34. Per RD Joe Prusaitis' race report, the 100-mile finish rate was the lowest in the 19-year history of the race: 190 out of 316 who started the race = 60%. Fifty-milers fared better, with a finish rate of 85% (166 of 196 who began the race). Most of our friends did well in their respective races. 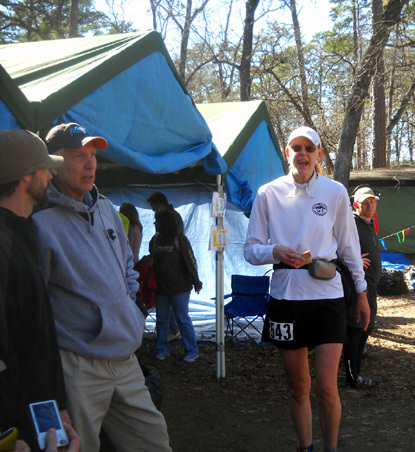 For example, in the 50-miler Anne Watts came close to her goal of 12 hours, finishing in 12:05. 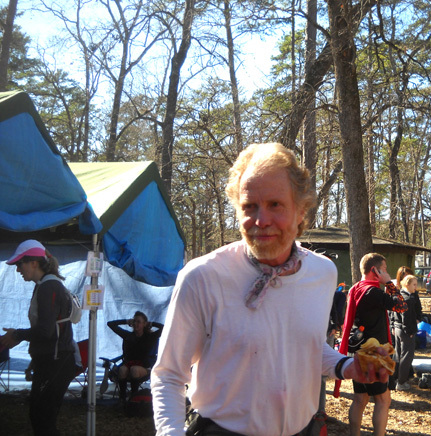 Larry Hall finished in 7:52 to place 13th overall. Tammy Massie ran to a 9:30 finish, a great start to her training for the Grand Slam this summer. Grant Holdaway (Wendy's dad), still going strong at age 79, finished in 14:55. Deborah Sexton was a few seconds behind him in 14:56. Matt wisely takes a little time to eat and drink at 40 miles. 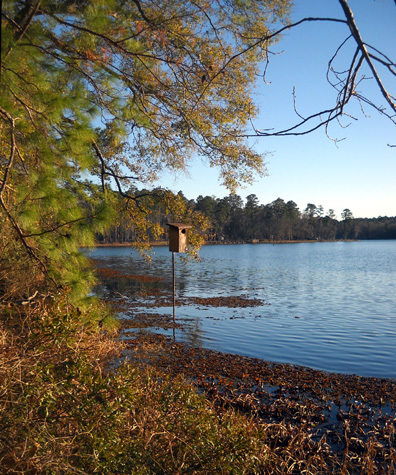 We woke to sunshine and a temperature of 38�F. on Sunday morning. It rose to 56�F. by the time we left the park at 11AM to head farther south to Brazos Bend State Park. We did not go to the race finish to see the last runners come in, nor did we stay in Huntsville long enough to attend the awards breakfast. 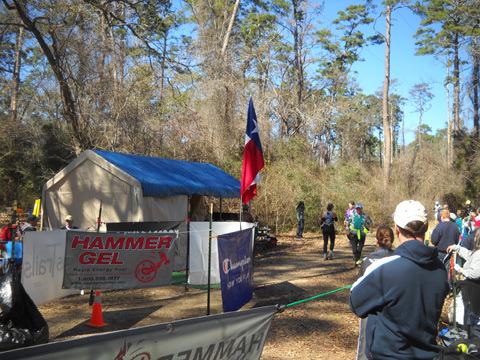 When we left the park most of the finish line tents and canopies were down, as were the two aid stations we passed on the park road on our way out to I-45. Race staff and/or volunteers do a good job of clean-up after this race, although in previous years when we've stayed longer I've seen trash (mostly toilet paper) out on the trails the next day. I'll pick up litter, but not used t.p.! Since we weren't involved as volunteers for the race this year we don't know if anything major went wrong besides the cold weather, difficulties of both volunteers and runners getting to the race site, injuries from icy bog boards, and hiccups with the "live" internet race results. Race staff is responsible for only the results. The runners' internet race reports I've read had no complaints. Neither did the thank-you's posted on the race website. 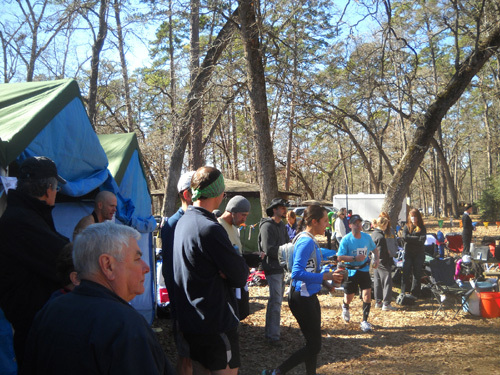 The 500+ runners who made it to the race appear to be satisfied once again, attesting to the skills and hard work of Joe Prusaitis, the other Tejas Trails staff members, and numerous dedicated volunteers who make this race "run" so well. We recommend this race if you haven't run it before. As long as Jim continues to run ultras, we'll probably be back. If all 700 runners ever show up, the race starts will be very crowded but the runners spread out fairly quickly. That -- and parking, if you aren't officially camping in the park the night before the race -- are the main downsides of this event. If you check out the weather history on the race website you'll see that this year's weather was an anomaly. Don't let that scare you off.